Ukrainian parliament speaker Volodymyr Groisman appears set on taking Arseniy Yatsenyuk's place as the country's next prime minister, with the country's political elite maneuvering to form a new coalition government; unfortunately, there's nothing amusing in what's shaping up to be the next episode in Ukraine's long and tragic political soap opera. Ukraine is in the midst of its latest political crisis, this time over the imminent ouster of Prime Minister Arseniy Yatsenyuk, who is facing the disintegration of his parliamentary coalition, and whose approval ratings have sunk to the low single digits. 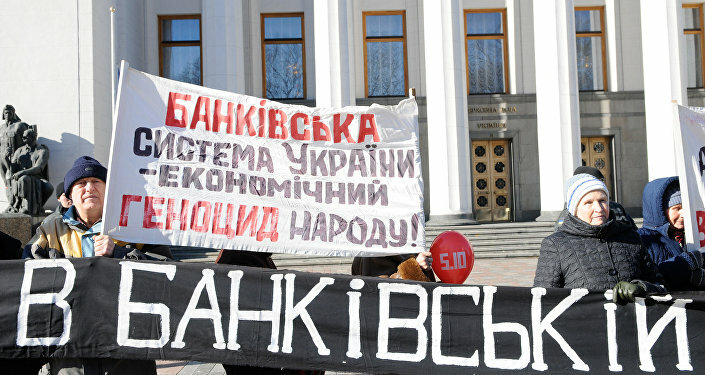 The political tussle, which began last month after a failed no confidence vote against Yatsenyuk and his cabinet, has dragged into this month, with the country's pro-EU political forces (which have dominated Ukraine's politics since the Maidan coup d'etat in February 2014) becoming increasingly fractured, and candidates, including speaker Groisman and US-born finance minister Natalie Jaresko rolled out to take Yatsenyuk's place. 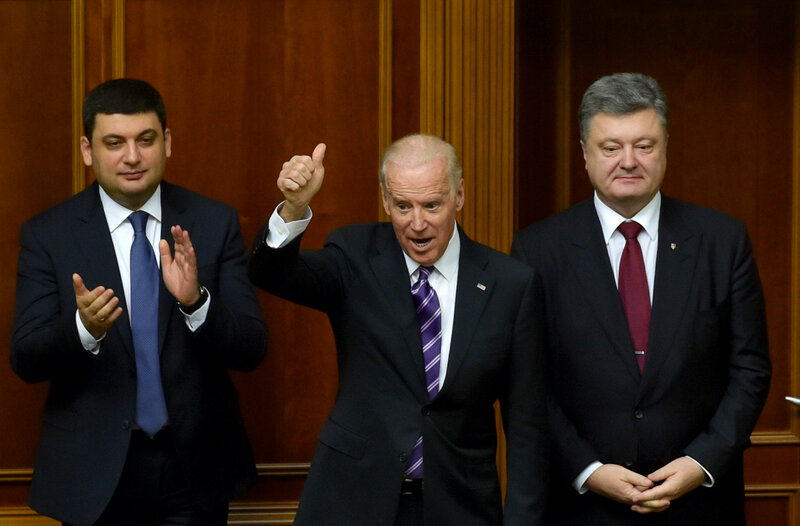 Vice President Joe Biden at a meeting of Ukraine's Verkhovna Rada in Kiev. Right: Ukrainian President Petro Poroshenko. Left: Verkhovna Rada Speaker Vladimir Groisman. While President Petro Poroshenko vowed to end the crisis by the end of the month, Yatsenyuk has rejected calls to resign, suggesting that there is no alternative to his program, and adding that the campaign to oust him is like a bad political cartoon. On Monday, the Petro Poroshenko Bloc nominated Groisman as candidate for PM, adding that the party would leave the ruling coalition until a new cabinet of ministers was chosen. Later Monday, Poroshenko urged his allies to form a new government for the sake of Western credits. "We are talking about a billion dollars in US loan guarantees – about a new program on national defense approved by Congress. If there is no solution [to the crisis] we won't get the US guarantees and those of the [IMF] program," the president noted. Commenting on the confusing, shady and exhausting political drama which is contemporary Ukrainian politics in the Russian business magazine Expert, Russian-Armenian political analyst Gevorg Mirzayan suggested that whatever happens, Moscow must take the situation seriously, since past outbursts in this 'Ukrainian political soap opera' have ended in political and economic chaos and the deaths of thousands of people by civil war. 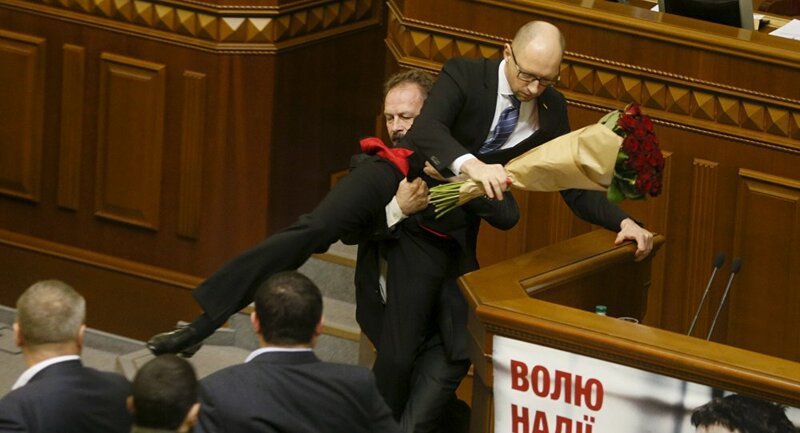 "It seems that kamikaze Prime Minister Arseniy Yatsenyuk will be found to be guilty of all [of Ukraine's] troubles. Apart from part of his own party, he has almost no sympathizers left in parliament," Mirzayan recalled, citing Fatherland Party leader Yulia Tymoshenko. She had earlier suggested that "it would have been good to vote for Yatsenyuk's resignation at least half a year ago, and even better not to appoint such ignorant and absolutist nihilists to the post of prime minister." "The ruling coalition in Ukraine has virtually self-destructed. The Petro Poroshenko Bloc has decided to withdraw from the coalition until a new prime minister is chosen. The faction has nominated Verkhovna Rada speaker Volodymyr Groisman, a faithful ally of the president, to the post," the analyst added. "It seems that Groisman's appointment has already been agreed upon. There is talk of his ministerial team. They will not be able to manage here without a new group of carpetbaggers; here former Slovakian finance minister Ivan Miklos [a Slovakian citizen] has already given his agreement on appointment to the finance ministry, and the post of deputy prime minister." "Of course, not everyone in Ukraine is happy about the recruitment of such 'Vikings', especially against the backdrop of the current, discredited group of foreigner ministers, activists and governors." "The whole world is fighting for consumer markets, sources of raw materials, resources. Who can guarantee that the foreigners invited to the Ukrainian government will defend the interests of Ukrainian producers, rather than those of foreigners, and the Ukrainian state, rather than their own," said People's Will parliamentary group leader Yaroslav Moskalenko. "Qualitative reforms have always been carried out by the people of these countries [themselves]. The Ukrainian dream cannot be designed by Americans, Georgians, Slovaks, [Balts], or anyone else," Moskalenko added, in a jab at US citizen Jaresko, Georgian Odessa governor Mikheil Saakashvili, Miklos and Lithuanian ex-economy minister Aivaras Abromavicius. "We must build our own country ourselves." On the other hand, Mirzayan sardonically noted, "if the current, Ukrainian-born authorities do not want to build Ukraine themselves – to stop the civil war in the Donbass, to pursue economic development, to restore relations with Russia, to carry out federalization, what difference does it make who ruins the country?" For post-Maidan Ukraine, the commentator suggested, "the problem is that the West is less and less interested" in Ukraine's problems, from the fate of Ukrainian volunteer battalion fighter Nadezhda Savchenko, to the civil war in Donbass, and even Crimea. "Kiev is disappearing from the front pages, and even the second pages of the Western media." The analyst cited a recent article by Cato Institute senior fellow Doug Bandow, who suggested that "'Old Europe' feels little threat from the east," and doesn't feel the economic benefits of integrating Ukraine into the EU economically would be worth it. "Today Kiev is an economic black hole and fiscally strapped Europeans have showed no inclination to contribute anything close to the aid levels required by Ukraine. The US has even less interest in the region. Other than Ukrainian expatriates who believe the sun rises and sets in Kiev and ideological Neoconservatives who believe Washington should [wage] war against any power that resists America's dictates, few Americans even think about Ukraine," Bandow added. Ultimately, Mirzayan suggests, "against the background of Ukrainian authorities' reluctance to freeze the conflict in Donbass, and their simultaneous unwillingness to disobey their Western curators and resume hostilities, Moscow should expect an imitation of patriotism on the part of Ukrainian lawmakers and individual politicians." "Thus, for example, lawmakers have definitively banned the screening of Russian films and TV series produced since 2014. Moreover, an online petition has appeared asking the president to levy a fee for Russian satellites flying over Ukrainian territory. If Russia refuses to pay, the petition says, the satellites should be confiscated and destroyed as contraband." "Moscow, of course, responded to the proposal with irony. 'The Banderites have decided to shoot down Roscosmos satellites…We must assume that the entire National Guard will be involved in pulling back the rubber band on the slingshot that will be involved,' joked Deputy Prime Minister Dmitri Rogozin." Unfortunately, Mirzayan notes, "there is little that is funny here, if we are talking about trends." "Once, Russia already let the trend slip away, when under Yushchenko and Yanukovych we looked forward to the next act under the circus tent known as 'a session of the Verkhovna Rada', and laughed at the characters of the Ukrainian political soap opera. In the end, this ended in civil war and thousands of victims. Ukraine should not be ignored, but be engaged. After all, when Maidan comes to an end, rebuilding the country and reestablishing a semblance of authority there will fall not to Europe and the United States, but to Russia."